Some may recall playing at this site previously only to see it close its doors in 2015. While there certainly are more fish in the sea, Goldfish Bingo re-launched in 2016 featuring nearly 40 real money games. As part of the Best Bingo Network, they are back on the Cozy Games platform. Not much else has changed and even the same familiar logo was brought back. One thing that is different is the licensing; previously licensed in Malta, Goldfish Bingo is now licensed in the UK and the Isle of Man. The selection of bingo games is plentiful with a nice selection of bingo variations including the UK’s 90-ball bingo, America’s favorite 75-ball bingo plus 80-ball, 50-ball and 30-ball games. Jackpot Games amazing cash prizes including Fish Toons, Treasure of Egypt, Lucky Devil, Top Speed, and Coffee House Slots for starters. Make your way over to other Video Slots and enjoy a host of exhilarating Bonus Games including Free Spins, Wheel Spins, Multipliers and Wilds. Casino games includes variations of Blackjack, Deuces Wild, Roulette, Jacks or Better and Keno. Players may take their game along with them via smartphone or tablet. Nothing is better than testing out a site without having to spend a cent of your own money except when it involves a Free Trial Bonus. Sure you can try out the games but you won’t be able to cashout a penny of your winnings. If you’re ready to deposit, claim the deposit bonus to prolong your play time or bump up your wagering power. 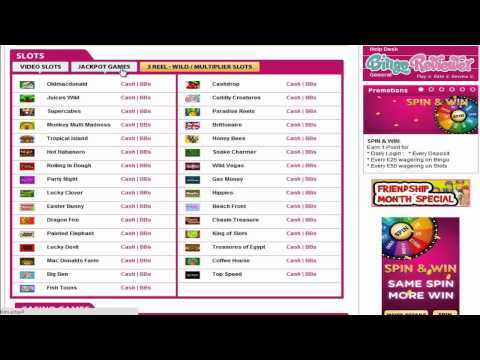 Check out free bingo games where you can win real cash. Other promotions include tournaments, a daily raffle, cashback and much more. Simply keep an eye on the promotions page email and social pages for the latest promotional offers. If you’ve played at one Cozy powered site then you’ve played at them all. The truth is there is nothing new or unique about this brand but with that said, it is one that you can rely on. The software has been around since 2005 and has brought joy to online bingo players over the years. Take note of the minimum withdrawal limit of £30 and the weekly withdrawal limit of £300 for all games. If you win a progressive jackpot on Slots, you will be paid £1,000 each week. We rate Goldfish Bingo with 3.5 Pink Hearts. wagering rquirements are extortionate, plus the fact you have to depo £25 before you can request a withdrawal. stupid limits on withdrawals, and only process mon & wed. taken nearly 2 weeks to get winnings because of limits. wont be going back. I’ve played at this site a few times and overall I think it’s a fairly decent one. It’s extremely easy to navigate and I especially like that they have a lot of general information that many of us would like to know located right on their homepage. A lot of sites require you to become a member before you really know the deal, but not this one. Just head to the site, member or not, and you can view all their latest promotions, hottest games, bingo rooms and prices and they even provide players with quick links to the most popular games which definitely come in handy. Their games run smoothly and I have yet to have any issues which is no surprise because they are powered by cozy software. For bingo, I would definitely suggest heading over to the 2p 90 ball room because at that prices it’s the closest you’ll get to free. That would be this site’s only downfall for me. They don’t have a designated free room for bingo. I found this site by looking for a place that will give me the opportunity to explore various variants of the game. They have the classic games (75 and 90 ball bingo), but also 80 ball and the 30 ball, and the last one was the most interesting for me. The rules are similar, but it runs faster and that is just what I needed. There are five different rooms at the moment. They also have quite a number of other games, like slots, scratch cards and even casino games, so it is not one of those bingo exclusive sites, which is a good thing if you like to play a lot of different games at one place. By signing up, you get up to 50 games to try, and that's just great, because you can get a bit more familiar with those games before making a deposit. Once you do, you will earn a 300% bonus, and after that a 450% Reload bonus. They start players off with a very nice welcome bonus here! Players will get £15 free with no deposit required. They also give you a 300% bonus on the first three deposits. This is definitely not a bad way to start out your gaming experience. I really like the layout here and they have all kinds of awesome promos up for grabs, especially when it comes to different holidays. They are known for having unlimited chat games on a regular basis. It’s a super easy way to double up on your play while simultaneously playing a game of bingo. Also, when you play their chat games on a regular basis, you can also receive up to 200% in bonus bucks on your last deposit. They also have a very nice loyalty program here in which you can take advantage of a number of benefits the more you play at the site.